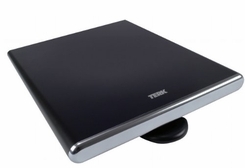 TERK digital flat indoor antenna has a patented reception technology that outperforms traditional antennas. 360 degree reception pattern eliminates the need for constant adjustments. The removeable Extremely Low Noise (ELN) amplifier provides maximum flexibility and performance and gives you outstanding digital TV reception without saturating the signal. its high-gain design picks up further stations. This antenna is optimized for HDTV reception and has a flat profile designed to blend in with today's high-end HDTV systems. Comes with a 3 way mounting bracket so it can hang, stand up, or lay flat. Has 1 year limited warranty. Enjoy top-rated HDTV network programming and your favorite shows for Free. * No monthly fee, no subscription, no contract. Supports up to 1080i HDTV broadcasts for high-quality picture and sound *Network availability and range varies by area and terrain.